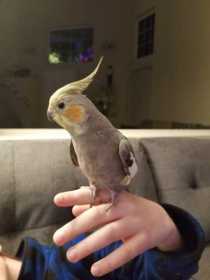 Cookie is a normal grey cockatiel (dark grey, white wings, yellow head and bright orange cheek patches). He can say his name Cookie. The picture was taken months ago, his head is now yellow.